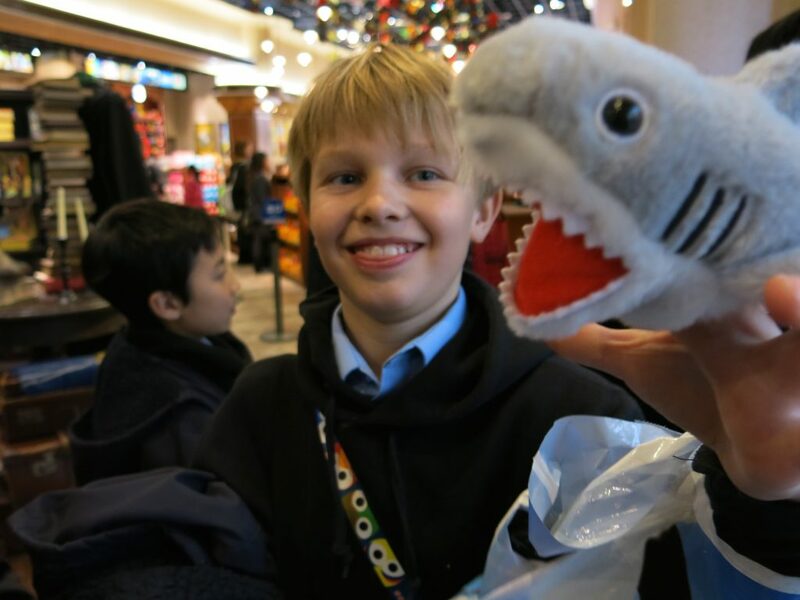 We start the story as we usually do, in an airport – about 2 hours after most of us finished school for Christmas. Off we flew. We landed in Osaka after a steady flight from London, after many plane movies. We arrived quite late in the day, hungry and tired, so it was off to the Royal Hotel Osaka for a gorgeous buffet before bed. Needless to say, it was a lovely change from the plane food we had not been eating. After a long night’s rest, it was straight to singing on a very frosty chilly morning. We braved the cold for a morning soundcheck at Universal Studios, before the park was flooded with Christmas actors and Christmas spirit. Thankfully, we were allowed to keep our coats on, and after a few short run-throughs we were let loose in Universal Studios Japan. We revisited some of our favourite rides from our last visit, recommending only the best to the boys who had never been away with us before. We went to the shops where some of us bought sophisticated little objects and some others bought huge pink fluffy teddy bears. We then went on to the big ride of the park (and then in big speech marks) “Hollywood Dreams Universal”. The screams of the boys echoed all the way to the next big ride of the park, (and again in big speech marks) “Space Fantasy”. Harry Potter World was a definite must, and although we really were ‘Far Away’ from our beloved King’s Cross Station, we had great fun on all the rides once again particularly the big “Harry Potter 4D ride” (again in big speech marks)… this was the most popular ride of the boys – it was an adrenaline rush. Of course, a Christmas trip would not be completed without a Christmas dinner, and we were supplied with a magical feast ‘English Style’ Christmas Lunch. We feasted on plump pigeons, or something like that, long sausages and roasted vegetables. We ate it all. Even some of the sprouts. After a hard morning and lunchtime of enjoying the park, we quickly snuck back to our hotel for some resting time. When we left the hotel again, it was beginning to get dark, as we began to prepare for Universal’s ‘Wonder Christmas’. We were in fact given special thermal underclothes to combat the cold weather, and so the cold was no problem for us on stage. We performed to the welcoming audience of around 9,000 people, some of who had started taking their seats 12 hours earlier, and we were grateful for all their support. When we had finished, we went back to our dressing room for a quick dinner, so we had plenty of time to enjoy the second part of the incredible Wonder Christmas. Hardly any of us had ever witness such amazing technology and staging, which combined with the amazing performers created a really enjoyable show. When we sang we had to stand in special places because the lighting was planned around our positions. The Christmas spirit was raging through us. So much so that we decided we would stay a little longer to ride some of the rollercoasters in the dark! We were knackered after such an action packed day, so before it got really late, we went back to the hotel. Another night’s rest had passed, and today was our first concert day. Some of us went off in the morning to do a special performance on national live TV, which aired to the entire country. Don’t worry, the rest of us didn’t miss out – we went off to do some signings at shops in Osaka. We all regrouped in time for a soundcheck, and the usual concert routine began at the Osaka International Convention Center. We had a great show, and quinta zillions of lovely people queued to meet us at the end. On the Tuesday, it was time to say our goodbyes to Osaka. We weren’t going home just yet though, as Tokyo awaited us at the end of a short plane journey. After we landed mid morning, it was off for a quick lunch, as we had another working day planned. 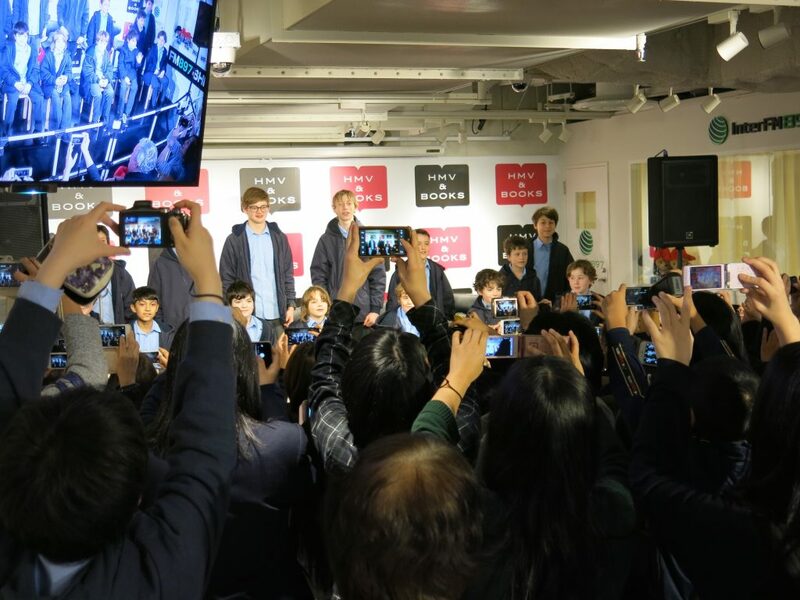 We split off again: half of us went to another TV performance on NHK TV, whilst half of us went again to sign at huge shops like HMV and Tower Records to meet and greet some fans. Regardless, both groups enjoyed it. We were rewarded for our hard work in the evening with a trip to the local aquarium. Many a cuddly toy were purchased, and the fish weren’t going anywhere anytime soon. We particularly enjoyed the Christmas remix playlist in one of the rooms with the flashing lights and weird jelly fish that some boys tried to imitate. The swinging pirates ride was also a star attraction – Ah hah. The next day was a very busy day. Two shows in 12 hours meant we needed our good night’s sleep. These two shows would take place at Tokyo Opera City Hall, and we were amazed at how the architecture of this building created such an interesting venue for us to perform in. We had a soundcheck, and then performed our first show. We had plenty of time to rest up in Denny’s across the road, before we headed back to prepare for our second show. It was amazing to see so many people at both shows in one day, and the octo zillion signing at the end was proof of the fantastic support. That brought our tour to a lovely ending, as the next day was a flight back home. We got back late afternoon on Christmas Eve – just in time for Santa who finds you wherever you are! See you next time. And happy new year! It’s good to hear that you had a great time visiting Japan. It must be a unique experience to travel around the world and give performances. Especially at such a young age. I sincerely hope that all of you can cherish every of your performances, enrich your childhood and experience the charm of music. Dear Libera, I wish you people would come one day to South Africa! It would be great to see you live. All the best for your concert!! !